Offering a unique augmentation to classroom training with a full experience simulator, we provide students with the opportunity to sit behind the wheel in a realistic simulated environment with high quality graphics, 3D sound and accurate force feedback, vibrations and motion. 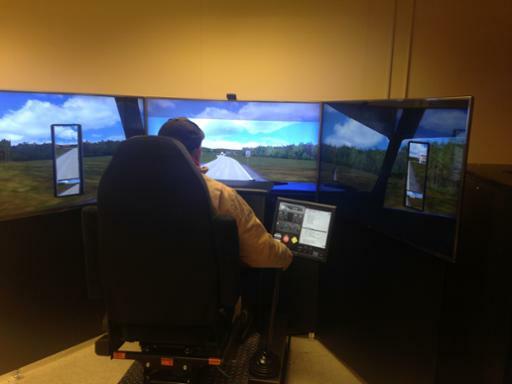 This program provides students with lifelike scenarios of a variety of environments that drivers may encounter. Skills in defensive driving, gear shifting and fuel management are provided to introduce students to the proper techniques needed to overcome hazardous situations. This one of a kind approach to learning matched with skilled professional faculty makes this program an exceptional training experience for all students. With fuel prices consistently fluctuating, this course delivers tips and techniques that assist in the financial savings of company budgets. This program features 4 Hours of Intensive Shifting and Defensive Driving Techniques. Note: For more information and registration, please call 216.987.3226. Please call 216-987-3226 to register. This program features 4 Hours of Intensive Shifting and Defensive Driving Techniques for Commercial Bus Driving or School Bus Driving. Note: For more information and registration, please call 216.987.3226. This program features 8 Hours of fuel saving and optimization of performance techniques. This program features 8 Hours of fuel saving and optimization of performance techniques for Commercial Bus Driving or School Bus Driving.